②Frances G. Davenport, “The Decay of Villeinage in East Anglia,” Transactions of the Royal Historical Society, New Series, vol. 14, 1900; D. C. Douglas, The Social Structure of Medieval East Anglia, Oxford: Oxford University Press, 1927;R. H. C. Davis, “East Anglia and the Danelaw,” Transactions of the Royal Historical Society, 5th Series vol. 5, 1955; Barbara Dodwell, “Holdings and Inheritance in Medieval East Anglia,” The Economic History Review, New Series, vol. 20, no. 1, 1967. ③Bruce M. S. Campbell, “Population Change and the Genesis of Commonfields on a Norfolk Manor,” The Economic History Review, New Series, vol. 33, no. 2, 1980; “The Regional Uniqueness of English Field Systems? Some Evidence from Eastern Norfolk,” The Agricultural History Review, vol. 29, no. 1, 1981; “Agricultural Progress in Medieval England: Some Evidence from Eastern Norfolk,” The Economic History Review, New Series, vol. 36, no. 1, 1983; “Arable Productivity in Medieval England: Some Evidence from Norfolk,” Journal of Economic History, vol. 43, no. 2, 1983; Z. Razi, “Manorial Court Rolls and Local Population: An East Anglian Case Study,” The Economic History Review, New Series, vol. 49, no. 4, 1996; C.Harper-Bill, Medieval East Anglia, Woodbridge: The Boydell Press, 2005. ④Such as E. Lipson, The History of the Woollen and Worsted Industry, London: A. and C. Black, 1921 ;D. C. Coleman, “An Innovation and Its Diffusion: The ‘New Draperies, ‘”The Economic History Review, New Series, vol. 22, no. 3, 1969; G. D. Ramsay, The English Woollen Industry 1500-1750, London: Macmillan Publishers Ltd., 1982. ⑤Jane Whittle, The Development of Agrarian Capitalism: Land and Labour in Norfolk, 1440-1580, Oxford: Oxford University Press, 2000; Stephen K. Land, Kett’s Rebellion: The Norfolk Rising of 1549, Woodbridge: The Boydell Press, 1977. ⑥R. A. C. Parker, “Coke of Norfolk and the Agrarian Revolution,” The Economic History Review, New Series, vol. 8, no. 2, 1955; K. J. Allison, “The Sheep-Corn Husbandry of Norfolk in the Sixteenth and Seventeenth Centuries,” Agricultural History Review, vol. 5, no. 1, 1957; Bruce M. S. Campbell, “Commercial Dairy Production on Medieval English Demesne: The Case of Norfolk,” in The Medieval Antecedents of English Agricultural Progress, Farnham: Ashgate Pulishing Ltd. , 2007; Mark Overton, “The Diffusion of Agricultural Innovations in Early Modern England: Turnips and Clover in Norfolk and Suffolk, 1580-1740,” Transactions of the Institute of British Geographers, New Series, vol. 10, no. 2,1985; Susanna Wade Martins and Tom Williamson, Roots of Change: Farming and the Landscape in East Anglia, c. 1700-1870, Exeter: British Agricultural History Society, 1999. ⑦J. H. Clapham, “The Transference of the Worsted Industry from Norfolk to the West Riding,” The Economic Journal, vol. 20, no. 78, 1910; M. F. Lloyd Prichard, “The Decline of Norwich,” The Economic History Review, New Series, vol. 3, no. 3, 1951; John T. Evans, “The Decline of Oligarchy in Seventeenth-Century Norwich,” The Journal of British Studies, vol. 14, no. 1, 1974. ⑧R. H. C. Davis, “East Anglia and the Danelaw,” p. 30. ⑨H. C. Darby, “The Domesday Geography of Norfolk and Suffolk,” The Geographical Journal, vol. 85, no. 5（May 1935）, p.433. （11）R. H. C. Davis, “East Anglia and the Danelaw,” pp. 25, 32,33. （12）R. H. C. Davis, “East Anglia and the Danelaw,” pp. 35-36. （13）D. C. Douglas, The Social Structure of Medieval East Anglia, p. 3. （14）D. C. Douglas, The Social Structure of Medieval East Anglia, p.219. （16）D. C. Douglas，The Social Structure of Medieval East Anglia，p.40. （19）M. E. Seebohm, The Evolution o f the English Farm , Boston: Harvard University Press, 1927, pp. 136, 156. （20）Bruce M. S. Campbell, “Agricultural Progress in Medieval England: Some Evidence from Eastern Norfolk,” p. 35. （22）Bruce M. S. Campbell, “Arable Productivity in Medieval England: Some Evidence from Norfolk,” p. 388. （23）Bruce M. S. Campbell, “Agricultural Progress in Medieval England: Some Evidence from Eastern Norfolk,” pp. 28-29. （24）Frances G. Davenport, “The Decay of Villeinage in East Anglia,” Transactions of the Royal Historical Society, New Series, vol. 14, 1900, pp. 126-129; Jane Whittle, The Development of Agrarian Capitalism: Land and Labour in Norfolk, 1440-1580, p. 192. （25）George C. Homans, “The Explanation of English Regional Differences,” Past and Present, no. 42（Feb. 1969）, p.26. （26）Barbara Dodwell, “Holdings and Inheritance in Medieval East Anglia,” p. 61. （27）Bruce M. S. Campbell, “Population Change and the Genesis of Commonfields on a Norfolk Manor,” p. 190. （28）Herbert Eiden, “Norfolk, 1382: A Sequel to the Peasants’ Revolt,” The English Historical Review, vol. 114, no. 456, 1999, pp. 370-373. （29）Frances G. Davenport, “The Decay of Villeinage in East Anglia,” pp. 131-132. （30）D. M. Palliser, ed., The Cambridge Urban History of Britain, vol. 1（600-1540）, Cambridge: Cambridge University Press, 2000, p. 649. （31）Larry R. Ford, “Continuity and Change in Historic Cities: Bath, Chester, and Norwich,” Geographical Review, vol. 68, no. 3（July 1978）, pp. 267-268. （32）Heather Swanson, Medieval British Towns, New York: St. Martin’s Press, 1999, p.24. （33）Heather Swanson, Medieval British Towns, p. 35. （34）Susan Reynolds, An Introduction to the History of English Medieval Towns, Oxford: Clarendon Press, 1977, p.57. （35）Susan Reynolds, An Introduction to the History of English Medieval Towns, p. 148. （36）C. D. Harris, “Ipswich, England,” Economic Geography, vol. 18, 1942, p.1. （37）W. S. Shears, This England: A Book of the Shires and Counties, London: The Right Book Club, 1948, p. 89. （38）Gladys A. Thornton, “A Study in the History of Clare, Suffolk, with Special Reference to Its Development as a Borough,” Transactions of the Royal Historical Society , 4th Series, vol. 11,1928, pp. 87, 101. （39）Susan Reynolds, An Introduction to the History of English Medieval Towns, p. 155. （40）E. Lipson, The History of the Woollen and Worsted Industry, p. 230. （41）E. M. Carus-Wilson, “The English Cloth Industry in the Late Twelfth and Early Thirteenth Centuries,” The Economic History Review, vol. 14, no. 1,1944, p.33. （42）William Page, The Victoria History of the County of Suffolk, vol. 2, Folkestone: Dawson, 1907, p. 255. （43）W. A. Dutt, Nor folk, Cambridge: Cambridge University Press, 1909, p.66. （46）R. H. Hilton, The English Peasantry in the Later Middle Ages, Oxford: Clarendon Press, 1975, p. 37. （48）C. Harper-Bill, Medieval East Anglia, p. 60. （49）Joan Thirsk, The Agrarian History of England and Wales, vol. 4, 1500-1640, Cambridge: Cambridge University Press, 1967, p.241. （50）Stephen K. Land, Kett’s Rebellion: The Norfolk Rising of 1549, p. 9. （51）R. H. Tawney, The Agrarian Problem in the Sixteenth Century, New York: Harper & Row, 1967, p.212. （53）K. J. Allison, “The Sheep-Corn Husbandry of Norfolk in the Sixteenth and Seventeenth Centuries,” p. 27. （54）Mark Overton, “The Diffusion of Agricultural Innovations in Early Modern England: Turnips and Clover in Norfolk and Suffolk, 1580-1740,” p. 214. （55）W. J. Ashley, An Introduction to English Economic History and Theory, Part Ⅱ, London: Longmans, Green & Co., 1936, pp. 114-115. （57）W. J. Ashley, “The Early History of the English Woollen Industry,” Publications of the American Economic Association, vol. 2, no. 4（Sep. 1887）,p.84. （58）B. A. Holderness, Pre-Industrial England: Economy and Society from 1500 to 1750, London: Dent, 1976, p.91. （59）E. Lipson, The Economic History of England, vol. 1, London: A. & C. Black, 1945, p.496. （61）E. Lipson, The Economic History of England, vol. 1, p.496. （62）N. J. Williams, “Two Documents Concerning the New Draperies,” The Economic History Review, New Series, vol. 4, no. 3, 1952, p.357. （63）William Page, The Victoria History of the County of Suffolk, vol. 2, p.267. （64）W. S. Shears, This England: A Book of the Shires and Counties, p. 58. （66）D. C. Coleman, “An Innovation and Its Diffusion: The ‘New Draperies,’” p.424. （67）C. G. A. Clay, Economic Expansion and Social Change: England 1500-1700, Cambridge: Cambridge University Press, 1984, p.199. （68）N. J. Williams, “Two Documents Concerning the New Draperies,” p. 358. （69）John Smail, Merchants, Market and Manufacture, New York: St. Martin’s Press, 1999, p.128. （70）B. E. Supple, Commercial Crisis and Change in England 1600-1642, Cambridge: Cambridge University Press, 1959, p.103. （71）D. M. Palliser, The Cambridge Urban History of Britain, vol. 2（1540-1840）, Cambridge: Cambridge University Press, 2000, p.316. （73）J. A. Chartres, Internal Trade in England 1500-1700, London: Macmillan, 1977, p.28. （74）B. A. Holderness, Pre-Industrial England Economy and Society 1500-1700, p. 141. （75）Peter J. Bowden, The Wool Trade in Tudor and Stuart England, London: Frank Cass Publishers, 1971, pp. 65, 67. （76）Joan Thirsk, The Rural Economic of England, London: Hambledon Press, 1984, p.218. （77）Peter J. Bowden, The Wool Trade in Tudor and Stuart England, pp. 64-67. （78）B. E. Supple, Commercial Crisis and Change in England 1600-1642, pp. 103-104. （79）William Page, The Victoria History of the County of Suffolk, vol. 2, p. 266. （80）William Page, The Victoria History of the County of Suffolk, vol. 2, p. 260. （81）P. J. Bowden, “Wool Supply and the Woollen Industry,” The Economic History Review, New Series, vol. 9, no. 1,1956, pp. 53-54. （82）J. H. Clapham, “The Transference of the Worsted Industry from Norfolk to the West Riding,” p. 201. （83）J. H. Clapham, “The Transference of the Worsted Industry from Norfolk to the West Riding,” pp. 195-210. （84）D. T. Jenkins and K. G. Ponting, The British Wool Textile Industry 1770-1914, London: Heine mann Educational Books, 1982, p.2. （85）Carole Rawcliffe and Richard Wilson, Norwich since 1550, London: Hambledon, 2004, p.231. （86）Carole Rawcliffe and Richard Wilson, Norwich since 1550, p.231. （87）D. C. Coleman, “An Innovation and Its Diffusion: The ‘New Draperies,’” p.429. （88）E. Lipson, The History of the Woollen and Worsted Industry, p. 250. （89）A. Ferriday, A Regional Geography of the British Isles, London: Macmillan, 1961, p. 153. （90）E. L. Jones, “Agriculture and Economic Growth in England, 1660-1750: Agricultural Change,” The Journal of Economic History, vol. 25, no. 1（Mar. 1965）, p.4. （92）C. Singer, E. Holmyard, A. Hall and T. Williams, eds. , A History of Technology, vol. 3, From the Renaissance to the Industrial Revolution, c. 1500-c. 1750, Oxford: Clarendon Press, 1957, p. 320. （94）J. H. Plumb, “Sir Robert Walpole and Norfolk Husbandry,” The Economic History Review, New Series, vol. 5, no. 1, 1952, p.86. （95）D. 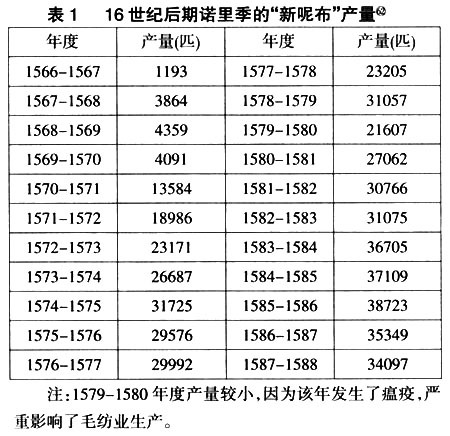 C. Coleman, The Economy of England 1450-1750, Oxford: Oxford University Press, 1977, p.116. （96）G. E. Fussell and Constance Goodman, “Crop Husbandry in Eighteenth Century England: Part 2,” Agricultural History, vol. 16, no. 1（Jan. 1942）, p. 62. （97）R. A. Dodgshon and R. A. Bntlin, eds., An Historical Geography of England and Wales, London: Academic Press, 1979, p.161. （98）Anne Digby and Charles Feinstein, eds. , New Directions in Economic and Social History, London: The Macmillan Press, 1989, p. 15. （99）Mark Overton, “Estimating Crop Yields from Probate Inventories: An Example from East Anglia, 1585-1735,” The Journal of Economic History, vol. 39, no. 2（Jun. 1979）, p.375. （100）B. M. S. Campbell and M. Overton, “A New Perspective on Medieval and Early Modern Agriculture: Six Centuries of Norfolk Farming c. 1250-c. 1850,” Past and Present, no. 141（Nov. 1993）, p. 70. （101）Gregory Clark, “Yields per Acre in English Agriculture, 1250-1860: Evidence from Labour Inputs,” The Economic History Review, New Series, vol. 44, no. 3（Aug. 1991）, p. 457. （102）Mark Overton, “The Diffusion of Agricultural Innovations in Early Modern England: Turnips and Clover in Norfolk and Suffolk, 1580-1740,” p. 213. （103）Edward Baines, “On the Woollen Manufacture of England; With Special Reference to the Leeds Clothing District,” Journal of the Statistical Society of London, vol. 22, no. 1（Mar. 1859）, p.16. （104）D. M. Palliser, The Cambridge Urban History of Britain, vol. 2（1540-1840）, pp. 316, 650. （105）Edward Baines, “On the Woollen Manufacture of England; With Special Reference to the Leeds Clothing District,” p. 15. （106）W. S. Shears, This England: A Book of the Shires and Counties, p. 58. （108）J. A. Chartres, Internal Trade in England 1500-1700, p.29. （109）L. A. Clarkson, Proto-Industrialization: The First Phase of Industrialization? London: Macmillan, 1985, p.33. （110）E. L. Jones, “Agricultural Origins of Industry,” Past and Present, no. 40, 1968, p. 70. （112）E. J. Buckatzsch, “The Geographical Distribution of Wealth in England, 1086-1843: An Experimental Study of Certain Tax Assessments,” The Economic History Review, New Series, vol. 3, no. 2, 1950, pp. 186-187. （113）Great Britain: Britain’s Clearest Mapping, London: Automobile Association Development Limited, 2002, p.64. （114）Irene Hardill, The Rise of the English Region? Regions and Cities, London: Routledge, 2006, p. 106. （115）E. J. Buckatzsch, “The Geographical Distribution of Wealth in England, 1086-1843: An Experimental Study of Certain Tax Assessments,” pp. 186-187.